The Imperial Lunar Handbook is the essential guide to the vast Lunar Empire. Mighty and magical, decadent and dynamic, conquering and liberating, the Empire is rich and complex, a land of heroes, soldiers, and missionaries. It is a fusion of many disparate regions, each with its own beliefs, customs, and magic. Over all, the Red Moon guides, and the Son of the Goddess rules. Children of the Goddess - An introduction to the mighty Lunar Empire, including information on What Everyone Knows, All Her Children, A Timeline of the Lunar Empire, Heroes and Other Exceptions, Governing the Empire, Travel in the Empire, The Imperial Army, and Homelands (including Dara Happa). Under the Red Moon - An overview of the nine satrapies of the Empire, the Western Reaches, and the Lunar Provinces, including six additional homelands for player heroes: Rinliddi, Sylila, Darjiin, Pelanda, Carmania, and the Lunar Provinces. Each homeland provides a keyword for that culture; common magic; a specialized religion, including common cults, practices, and orders; a sample magic keyword; and an illustration of a typical hero from the homeland. Hero Bands - The Stone Poets and the Seventh Chance File, two bands that beginning heroes can join right away. Associations - The Seeburn, one of the many associations that organize the people of the Empire. Imperial Lunar Handbook, Volume 1: The Lunar Empire is the first in a series that will detail the peoples, homelands, and religions of vast Peloria. Future volumes will concentrate on the most important regions within the Empire, including Dara Happa, Rinliddi, Carmania, and the Lunar Way that overlays all of the local religions. 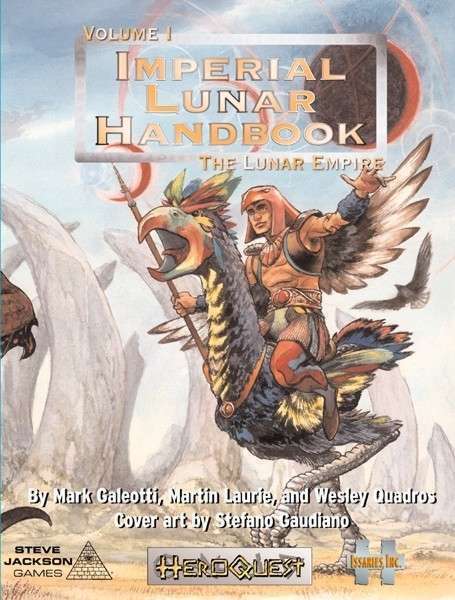 Imperial Lunar Handbook is intended for both players and narrators. You must own HeroQuest, Roleplaying in Glorantha, or Hero Wars to use it. This title was added to our catalog on August 12, 2007.